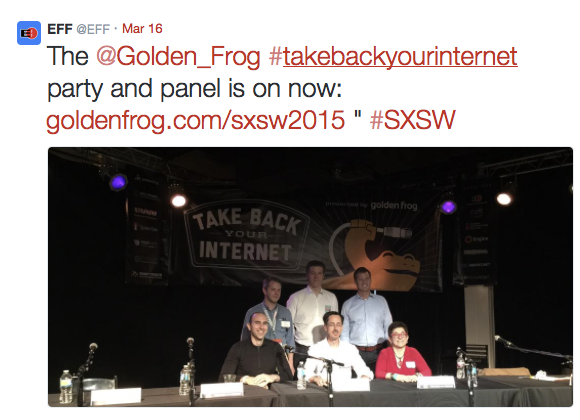 On March 16th, during SXSW Interactive 2015, we gathered some of the leading voices who supported the fight for Open Internet rules for a spirited discussion, celebration of FCC Title II regulation and a look forward to the next steps in the ongoing battle for the future of the Internet. Our third annual “Take Back Your Internet” panel and party was co-sponsored by SpiderOak, Giganews and Data Foundry. It was a hit and we had so much fun! We also received support from EFF, the Center for Technology and Democracy, Engine and the i2Coalition. It was fantastic getting to chat with many old Golden Frog friends and meeting new ones as well. During the networking party, guests enjoyed a fun photo booth and rounds of the Golden Frog themed corn toss. Check out some photos from the party! The discussion addressed the battle for an open, yet competitive Internet that respects user privacy. Our panel agreed that regulation is needed to keep the monopolistic ISPs in line, and discussed how Congress and the FCC should proceed to keep fighting for an Open Internet. You can also read the full transcript of the panel here. If you would like to read the complete list of tweets for the event, please follow #takebackyourinternet. Each year, the “Take Back Your Internet” event gets bigger and better. We look forward to seeing everyone there again next year.